It’s true. The result of bathroom and shower tile installation can both energize and calm you all at once. It comes from taking the perfect shower or soak your body craves. Knowing your bathing style, combined with the right touches and a beautifully tiled shower can create the ideal bathroom. To get there, it all starts with by collaborating with the dedicated tile installer at Jordan’s Tile & Stone. We have everything you need to turn your bathroom into the oasis you’ve always dreamed of. Whether you’re after an invigorating morning shower, a relaxing tub, or a bathroom multi-functional for both you and your kids, we can customize your bathroom to meet your needs. Our team will ask you just the right questions to make sure your design meets the needs of your household. Due to the moisture levels in a bathroom, providing the correct flooring is vital to the long-term safety and appearance of the room. If a carpeted floor is used, mould can frequently grow and cause health risks to the occupants. Vinyl flooring will often tear or come loose after long-term exposure to humidity. 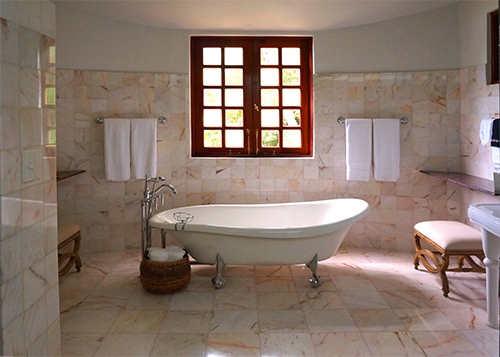 However, bathroom tile installation offers a classical, elegant option for years to come. The tile may not be used exclusively for the floors either. Wall tiles in the shower and near the sinks are very popular. Also, some homeowners prefer the look of tiled counters over that of granite or wood options. By using tile throughout the bathroom it will have a consistent look and be easier to decorate. While still easy to accomplish, bathroom tile installation can be more challenging than in other rooms of the house. One of the most important aspects of tile installation is to ensure that tiles are level. As most bathrooms include many uneven surfaces near the tub, special steps must be taken to accomplish this task. The first step is to use a level to check the walls are plumb and determine the angle of the tub. Then, by using special spacers and grouting, the tile should be cut according to the space available. Starting in the corner is a great way to test a less visible area. Special groups are also available for bathroom applications. They allow for the moisture level that will be present in coming years, and for the installer to apply in extra thickness where appropriate to ensure a level appearance. For the soap dish or towel rack areas it is also useful to have specialty glues near the tiling. Once the grout is applied, it should be washed off the tiles immediately. 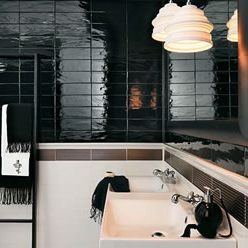 While careful not to dislodge the actual grout, if it is left to sit on the tiles, they will become hazy in appearance and require buffing at a later time. Due to the complexity of bathroom tile installation, some consumers feel more confident hiring a professional contractor. A contractor may add an extra 30% or above, but will usually offer a warranty on service. This peace of mind is often a selling point if a homeowner is considering selling their property. A contractor may also be useful in determining the right type of tile for usage. Some tiles are available with a rough surface, which can be useful to ensure against slips and falls. © 2019 All rights reserved. | Supported by To-the-TOP!